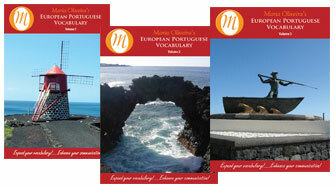 European Portuguese language learners can now purchase all three of Maria’s European Portuguese Vocabulary CD programs bundled into one affordable price and available for a limited time ONLY! Featuring fifty-seven lessons on three CDs, these European Portuguese Vocabulary programs expand your Portuguese conversational tools with a wide range of subjects. From food to household items, from shopping to medical needs, and so much more, all words are useful for business and social interactions with native European Portuguese speakers. Practice on your own schedule in your car, at home, anywhere! Programs also available as downloads! Learn to Speak Portuguese now!